In the history of various houses on this website, I frequently refer to the Landowners, and so I thought I would do a little on the land ownership. This first part is a brief history and is little more than a list of dates and names! There is more on some of these landowners below. It has all been researched, from many sources, and written by Nicky Street, and I apologise in advance if I have made any mistakes. A BRIEF HISTORY of BERWICK from SAXON times to TODAY. Edric the Saxon owned Berwick before 1066. After 1066 all land is owned by the King, and he then grants it to who he chooses. 1086 (Domesday) Nubold had Berwick, from Ernulf of Hesdin (who held it of King William I). Patrick of Chaworth held it as part of the Barony of Kempsford in Gloucestershire. Berwick, along with thousands of other acres, continued in the Chaworth family until 1307. In 1307 Berwick was given in a marriage settlement of 1307 to Henry of Lancaster, and then via the female line to Blanche wife of John of Gaunt Duke of Lancaster. As part of the Duchy of Lancaster on the accession of Henry IV (John of Gaunt’s son) to the throne of England, it became part of The Crown lands. Some notice does seem to have been taken by the villagers that they were owned by the Monarch, for the mill was called “The Queen’s Mill” in 1478. Around 1600 Adam Snow became the land owner, then Berwick was inherited by Catherine Crawford (nee Snow) who left it to Mary Wake (nee Crawford), then to William Wake in 1740, who sold it to James Harris in 1742 (he became Lord Malmesbury). The Harris family were very active and made a particularly useful survey of the village and lands! In 1815 Berwick was sold to Alexander Baring (Lord Ashburton), in 1896 to Mr Ernest T Hooley, in 1898 to Sir Christopher Furness. Up to this point none of the landowners lived in the village, or even very close. Many of them are unlikely to known anything about Berwick, and, probably cared less, judging by the way Berwick was passed about in Marriage Settlements, and to daughters etc. This changed with Stephen Furness who lived in Berwick, in what is now Berwick House. He and many of his family are buried in Berwick churchyard. In 1915 it was bought by Mary wife of Sir Cecil Chubb (who gave Stonehenge to the nation), it was acquired by the Board of Agriculture and Fisheries in 1919 and sold to Mr E Collins in 1921. In 1945 Mr F Bucknell bought it, and in 1954 sold half to Mr G Street. The remaining Bucknell part was sold to the Guinness estates (which, by then, included Druids Lodge) in 1995. This is the history of the main part of Berwick parish, not including Asserton. There was about 300 acres and a very few houses (in 1807 there were four) which separated from the main part in 1127. Patrick de Chaworth granted this part (called Bonhams) to Henry Daubeney along with Great Wishford, and this farm then followed the landowning history of Great Wishford. In 1302 to the Bonham family, sold in 1598 to Sir Richard Grobham, descending to John Howe (Lord Chedworth). In 1807 Lord Chedworth’s executors sold it to James Harris Lord Malmesbury, reuniting it with the rest of Berwick. The case of John Howe’s will went to The Court of Chancery (as in Bleak House) as the Chedworth family disagreed with the will. Although the case was upheld, the lands all had to be sold to pay the debts caused! JAMES HARRIS senior, and JAMES HARRIS, Lord Malmesbury. James Harris bought Berwick, along with other estates, in 1742 from William Wake whose wife Mary nee Crawford had inherited Berwick. James Harris was born in Salisbury in July 1707, he was educated at Bishop Wordsworth’s school and at Oxford. He inherited “independent means” and a house in the Close from his father in 1733. He was a Magistrate and MP (for Christchurch) and studied and wrote about classics and grammar. He died in 1780. His son, also called James Harris, who was later The 1st Earl of Malmesbury, was born on April 21st 1746 in Salisbury. He was educated at Winchester and Oxford. Whilst he was serving as a diplomat in Madrid he discovered a plot by the Spanish to attack the Falkland Islands and was rewarded by being appointed minister in Madrid. He rose to being minister to the Court of Prussia in 1772, and in 1777 was further promoted to the Court of Russia where he got on well with the notoriously difficult Catherine the Great. He inherited his father’s estates in 1780, which included Berwick. He continued to serve elsewhere in Europe with great success and was created Baron Malmesbury in September 1788. Amongst other things, in 1794 he was sent to Brunswick to meet the Princess Caroline for the Prince of Wales, to marry her as proxy and bring her to her husband in England. He gave up diplomacy in 1797 and was created Earl of Malmesbury in 1800 and lived at Heron Court in Hampshire. He was frequently consulted on foreign policy by successive foreign ministers particularly by Mr Cannings and Lord Palmerston. He bought the approximately 300 acres in Berwick he did not already own, from Lord Chedworth in 1808. He died on November 21st 1820, having sold Berwick and other estates to Alexander Baring Lord Ashburton in 1815. Alexander Baring, created 1st Baron Ashburton in 1835, bought the bulk of Stapleford, Winterbourne Stoke and Steeple Langford (but not Little Langford, Hanging Langford, Bathampton, or Great Wishford) from the estate of the late Lord Chedworth in 1808. At the same sale James Harris, Lord Malmesbury bought Lord Chedworth’s farm in Berwick. Lord Malmesbury owned the rest of Berwick at that time. Alexander Baring had to wait until 1815 until he was able to buy Berwick from Lord Malmesbury, thus linking together the lands he owned locally. Alexander Baring, then Lord Ashburton, died in 1848. With the barony Berwick (and Stapleford, Stoke etc) passed to his son William (died without male issue in 1864), and then William’s brother Francis (died 1868) to Francis’ son Alexander (died 1889) and to Alexander’s son Francis the 5th Baron Ashburton, who sold Berwick (and Stapleford, Stoke etc) in 1896 to Mr Ernest Terah Hooley. Alexander Baring was born on 27th October 1773, the second son of Sir Francis Baring, merchant and banker. He was sent to work with Hope and Co Bankers in Amsterdam and London. He was sent to the United States of America for various land deals (see below!) from 1796 to 1801, where he married Anne Louisa, daughter of William Bingham of Philadephia on 23rd August 1798. Alexander Baring became a partner in Barings in 1804 with his brothers and father. He continued as a financer and in 1813 he bought Hope and Co merchant banks, combining it with Baring Brothers Bank. In 1802 the Barings Bank and Hope and Co arranged the finance for the Louisiana Purchase. At that time France owned Louisiana, and Napoleon sold it to the US to help finance his war against Britain. Technically the United States did not purchase Louisiana from Napoleon. Louisiana was purchased by the US from Baring Brothers and Hope & Co. The payment for the purchase was made in US bonds, which Napoleon sold to Barings at a discount of 87 ½ per each $100. As a result Napoleon received only $8,831,250 in cash for Louisiana. Alexander Baring did much of the negotiating over the price himself, conferred with the French Director of the Public Treasury Francois Barbe-Marbois in Paris, went to the United States to pick up the bonds and took them to France. All this whilst Britain was at war with France! Alexander Baring 1st Baron Ashburton effectively retired from Barings Bank in 1825 aged only 52, and concentrated on politics. He was MP for Taunton, then for Callington, then for Thetford and finally for North Essex. He was President of the Board of Trade and Master of the Mint in Robert Peel’s government, and on the latter’s retirement was created Baron Ashburton on April 10th 1835. He continued his links with the USA, and was sent to America in 1842 by the British Government and negotiated the Webster Ashburton Treaty which settled the disputed position of the US Canadian border, the extradition of certain criminals and work on the suppression of the Slave Trade. He had nine children and died in May 1848. He lived at The Grange Northington Hants, and invested heavily in land and by the time of his death in 1848 his estates stretched across Hampshire, the Isle of Wight, Herefordshire, Somerset, Wiltshire, Suffolk and Norfolk. His London home was Bath House Piccadilly. He died on 12th May 1848 at Longleat House, the home of his daughter the Marchioness of Bath. And, before you ask, yes this is the same Barings Bank that collapsed in 1995 after one trader, Nick Leeson, lost $1.4 billion in speculation mainly on futures contracts! When Alexander Baring died in 1848 his estates were inherited by his son. It is quite likely that none of the Lords Ashburton ever visited any of our villages, as they appear to have lived mainly in London, and had little to do with this area. I could, of course, be wrong about this, and they may have known the area well – but I can find no evidence of that! William Bingham Baring 2nd Baron Ashburton was Alexander Baring’s oldest son. He was born in 1799, married Lady Harriet Montagu in 1823. She died in 1857, and in 1858 William married Louisa Stewart-McKenzie. He was MP for Thetford, then MP for Callington with his father, then for Winchester, then for North Staffordshire, and then back to Thetford (1841-1848). He was Secretary to the Board of Control from 1841 to 1845 and Paymaster General from 1845 to 1846. He became 2nd Lord Ashburton on his father’s death in 1848. He died 23rd March 1864. Francis Baring 3rd Baron Ashburton was the 2nd son of Alexander Baring and was born in 1800, he married Hortense Maret whose father was Hugues Maret Duc de Bassano, who had been a minister to Napoleon 1. Francis was MP for Thetford from 1848 (when his brother succeeded to the title of Baron Ashburton and had to leave the House of Commons.) He became Baron Ashburton in 1864 as his brother William only had a daughter! He died in September 1868. Alexander Hugh Baring 4th Baron Ashburton was born on 4th May 1835. He married Hon Leonora Digby in 1864, and succeeded to the title in September 1868 on the death of his father. He had been MP for Thetford (1857 to 1867) – as had his grandfather, uncle and father before him. Francis Denzil Baring 5th Baron Ashburton was born 20th July 1866 and died 27th March 1938. He married Hon Mabel Hood, and later Frances Donnelly. I haven’t managed to find out much about him, except that he was a Major in the Hampshire Yeomanry and Deputy Lieutenant of Hampshire. He sold Berwick (Stapleford, Stoke etc) to Mr E T Hooley in 1896. The sale price was supposed to be £50,000 but Mr Hooley is reputed to have given Lord Ashburton £68,000 worth of Dunlop shares. Mr Ernest Terah Hooley owned Berwick for barely two years between 1896 and 1898, but his story is a fascinating one. Ernest Terah Hooley was born in 1856, the son of a Nottingham Lace Manufacturer. He became a stockbroker and a company promoter. He was supposed to have been a master of persuasion and publicity although his methods quickly degenerated into duplicity and fraud. In his promotion of companies on the stock market he routinely published prospectuses and advertisements which made exaggerated claims, and bribed journalists to give favourable reviews. The shares of these companies rocketed, he sold his shares and the companies could not meet his promises of dividends etc and many collapsed – some very famous companies barely survived his “promotion” for example Dunlop, Schweppes, Bovril etc. Before his inevitable downfall he was very popular – even having a verse in a musical ballad. However, in 1898 he was declared bankrupt, and although he transferred most of his assets to his wife, he had to sell his Wiltshire Estates including Berwick. He carried on with various schemes, many fraudulent, for 40 years. He went bankrupt again in 1911, 1921 and 1939, and served short jail sentences for fraud in 1912 and 1922. However he finished up, he did a great deal for Berwick in the short time he owned it. He put in the pavement, which used to end just by the Reading Room and that was supposed to be as far as it had been built when he went bankrupt, and he improved every house and cottage, giving roses to many of the cottages. .. no more perfect illustration could be found in the Village of Berwick St James with its picturesque fine farm house – particularly suitable for the occupation of a gentleman desirous of combining Agriculture with Sport – the quaint old Church, clean street with paved footway fringed with cottage, the Village Inn, School House and Farm Buildings.” The Farm House is now Berwick House. Sir Christopher had bought the 10,913 acre Hooley estate in 1898 (including Berwick Stapleford and Winterbourne Stoke) and sold all except Berwick in 1909. Sir Christopher Furness was born on 23rd April 1852 in West Hartlepool. He was the 7th son of John and Averill Furness who ran a grocery and provisioning business which developed into one of the largest in the North East of England. Sir Christopher joined the family firm and in 1870 went to Sweden as a buyer. During the blockade of the Elbe by the French fleet, he secured a corner of the grain market and made £50,000 - £60,000 profit for the firm. The firm won large provisioning contracts importing foodstuffs from USA and Europe as Sir Christopher developed the shipping side and in 1877 bought sailing vessels. The firm was divided between the eldest brother Thomas and the youngest Christopher in 1882. Sir Christopher ran the shipping firm of transatlantic liners and tramping vessels. In 1891 he combined with the West Hartlepool Shipbuilding firm of Edward Withy and Co and calling it Furness Withy and Co. Sir Christopher also acquired interests in numerous steel, engineering coal and shipbuilding companies, as well as expanding the shipping side including the Argentinian frozen meat trade. By 1914 Furness group controlled over 1 million gross tons of shipping, Sir Christopher’s personal yacht Emerald was the first turbine-powered vessel to cross the Atlantic, and he built Britain’s first motor ship “Eavestone”. Sir Christopher was elected Liberal MP for Hartlepool in 1891, again in 1900 and 1906. He was knighted in 1895, and made Baron Furness of Grantley in 1910. I have a wonderful photograph showing a stout, round faced man with a large moustache and mutton chop whiskers. He apparently had a short temper, especially with those who prevaricated! He married Jane Suggitt in 1876, died on 10th November 1912 leaving his property to his only son Marmaduke. His nephew Sir Stephen Wilson Furness (son of Stephen Furness who lived in Berwick House) became chairman of Furness Withy and Co on Sir Christopher’s death. SIR CHRISTOPHER FURNESS and the 1909 sale. In 1898 Sir Christopher Furness bought the 10913 acre Wiltshire estate. According to the Daily Telegraph it cost him £98,000. Sir Christopher Furness lived in West Hartlepool, and was M P for Hartlepool in 1891-95, and 1900-10. He was a shipowner and shipbuilder, head of Furness Withy and Co, and the "Furness Line" of steamers. Having owned all this land, and the villages for eleven years in February 1909 Sir Christopher Furness sold most of the Estate to the Cavendish Land Company Ltd, (I think he was a director of the company – more research needed!) who then sold most of it again. However Berwick House, the village and the farm were retained for Mr Stephen Furness, Sir Christopher Furness’s brother, who actually lived in Berwick House. The fine marble memorial on the left wall of the Chancel of Berwick Church is to Stephen Furness who died in 1911, his wife, his son and daughter. On Tuesday and Wednesday the 21st and 22nd September 1909 at The White Hart in Salisbury by the Auctioneers Messrs Knight, Frank and Rutley of London with Messrs Waters and Rawlence of Salisbury, the southern part of the Estates were put up for Auction. (The parts around Devizes were auctioned on the Thursday, in Devizes). It included the villages of Steeple Langford , Winterbourne Stoke, Stapleford, All Cannings and Maddington with their 16 farms, 3 inns, a water mill, sporting estates, 10431 acres with about 130 farmhouses and cottages. Not all were sold on the day, many did not reach their reserves, but most seem to have been sold privately shortly after. I have chosen a small selection of the details of the places sold that might be of interest, all as reported in the Wiltshire Times. Asserton Sporting Estate comprising 2016 acres, there was spirited bidding until it was finally bought for £23,00 for Mr Beauchamp of Norton Hall, Bath, a racehorse owner. (And there is another fascinating story – in the book “The Druids Lodge Confederacy”). The Pelican Inn Stapleford sold to the tenant Mr G B Matthews for £850. Manor Farm Stapleford sold to Mr F Moore of Sherborne for £4950. The Bell Inn Winterbourne Stoke sold to Gibbs Mew & Co Brewers of Salisbury for £1100. Manor Farm Winterbourne Stoke 1488 acres was not sold at the sale, having failed to make the reserve. East Clyffe Farm Steeple Langford was sold to the tenant Mr Andrews for £9750. Why did Sir Christopher Furness buy the Hooley estates around and including Berwick? It seems likely that it was so that his brother Stephen could live in Berwick. Stephen Furness was born in West Hartlepool on 28th May 1848 to John and Averill Furness, and joined their grocery and provisioning business, developing it with his brothers into one of the largest in North East England. He married Mary, daughter of Mr Dixon Sharper of West Hartlepool on 4th July 1870. He and his brother Christopher went to Sweden shortly after the birth of his first child Kate, and set up a business connection there. Stephen and Mary must have loved Sweden, for they bought an estate in Hoby, near Kristianstad, (which is on the Baltic coast) and stayed, raising their many children there. Sir Christopher Furness returned to England, developed the shipping side of the business, the Furness business was divided between him and his brother Thomas in 1882. Mary died at Hoby on October 17th 1898 aged only 48. Stephen brought his family back to England, having lived in Sweden for around 26 years. In December 1898 the Hooley estates in Wiltshire were bought, and Stephen moved into Berwick House in 1899, the first landowner to live in the village. He farmed 1800 acres, and described himself as a farmer. He was a keen and up-to-date agriculturist and an especially good judge of horses and stock. In 1901 Stephen, his eldest daughter Kate (29) the two youngest children, Jane Astrid (10), and Tom (8) were here with three live-in servants. The cook came from Chelsea, the housemaid from Berwick and the footman, Victor Gustaforson, from Sweden. Of all their children only Kate stayed in Berwick, the older ones (the boys anyway) went to school in Harrogate whilst their parents were in Sweden, and they made their lives with their Furness cousins, in the Furness business, in the North East of England. Stephen and Mary’s oldest son Sir Stephen Wilson Furness took over from his uncle Sir Christopher Furness on Sir Christopher’s death in 1912. He was also chairman of many other companies in the north east, mainly relating to shipping and coal. He became MP for Hartlepool in 1910 and was created a baronet in 1913. Unfortunately he was killed in an accident in 1914. He lived at Tunstall Grange, West Hartlepool. In 1909 Sir Christopher Furness, or rather one of his companies, split up and sold all the Estate, except Berwick, with many farms going to their current owners. Stephen Furness died on June 19th 1911, and was buried in Berwick. His daughter Kate left Berwick to live with her brother Christopher Furness in County Durham. She died on 29th August 1919 aged 48, she is also buried in Berwick. Many of Stephen’s family have been buried in Berwick, and the Furness trust supported the Church for many years. Sir Christopher Furness kept Berwick, he died in 1912. It passed to his son Marmaduke, Lord Furness, who sold it in 1915 to Mary, wife of (later to be Sir) Cecil Chubb. Marmaduke Furness inherited Berwick from his father Sir Christopher Furness in 1912. The Hooley estates which had been bought in 1898, were sold in 1909, except for Berwick. Marmaduke’s uncle, Stephen Furness had lived in Berwick from 1898 to his death in 1911. Marmaduke, Lord Furness sold Berwick in 1915 to Mary Chubb wife of (later to be Sir) Cecil Chubb. I thought a few lines about Marmaduke, Lord Furness might be rather dull, but I ought to include him….then I did some research! Marmaduke Furness was born in West Hartlepool on 29th October 1883 the only son of Sir Christopher Furness. As a young man he took no part in the family business, and it is thought that he did not get on with his father. On his father’s death in 1912 Marmaduke inherited the title, and the lands, but Stephen Wilson Furness (Marmaduke’s cousin, and son of “our” Stephen Furness) took over the business. Unfortunately Stephen was killed in an accident in 1914 and Marmaduke decided to take over the businesses. Although he had no experience he became chairman of Furness, Withy in the same year, and took on directorships of many companies, and in spite of his late start, he proved very successful and in 1918 was created Viscount Furness in recognition of his work for the American Shipbuilding Industry. His first wife was Ada Daisy Hogg, daughter of a wealthy businessman G J H Hogg of Seaton Carew, she died in 1921 and was buried at sea off the coast of Portugal. They had two children, Averill (married Andrew Rattray in 1932), and Christopher. Lieutenant Christopher Furness of the Welsh Guards was killed on 24th May 1940 near Arras in France where his platoon was covering the retreat of transport to Douai. In a fight against hopeless odds, he made the enemy withdraw and allowed the vehicles to escape. He was awarded a posthumous Victoria Cross. Lord Furness (aged 43) married the 21 year old American Socialite Thelma Converse nee Morgan in 1926. Thelma’s niece was Gloria Vanderbilt. Thelma and Marmaduke were part of the social set in London, and she became very close to Edward Prince of Wales (later to be Edward VIII). They met regularly, and she went on safari with him in 1930 when a closer relationship developed and she became his weekend companion at Fort Belvedere until January 1934. In 1931 she introduced him to her friend Mrs Wallis Simpson, who supplanted her in the Prince’s affections in early 1934. Lord Furness and Thelma divorced in 1933, having had one son, William Anthony. Lord Furness married for a third time in 1933 to Enid Cavendish (previously Cameron nee Lindeman). He died on 6th October 1940 aged 56, only months after the death of his son Christopher. William Anthony Furness (Tony) was born on 31st March 1929, and inherited the title in 1940 aged only 11. On coming of age he entered the House of Lords and served there for many years, he also ran Furness Enterprises and was a theatrical “angel”. The Catholic Church was very important to him and he was a knight of the Sovereign Military Order of Malta. Eventually he focused all his efforts on working for the Order and lived as a tax exile in Martigny. He died on 1st May 1995, and having had no children, the title of Lord Furness became extinct. In 1915 Marmaduke, Lord Furness sold the Berwick estate to Mary wife of (later to be Sir) Cecil Chubb. Only a few months later Sir Cecil Chubb became famous for buying Stonehenge. Cecil Chubb was born on 14th April 1876 in Shrewton, the son of Alfred Chubb, a saddler and harness maker. He attended the village school, then to Bishop Wordsworth’s school as a pupil teacher, later as an assistant master. He met his future wife, Mary Finch Fern at a cricket match between Bishop Wordsworth’s school and Fisherton Asylum. He went to St Marks College London and Christ College Cambridge, where he received degrees in Natural Science (1904) and Law (1905). Meanwhile he married Mary on 2nd April 1902. Mary’s uncle Dr W Corbin Finch owned the Fisherton Asylum (until recently The Old Manor Hospital). The first patient was admitted to the private lunatic asylum in 1813, Dr Corbin Finch died in 1905, and the business was transferred to Mary Chubb in 1910, it was made a limited company in 1924, and Sir Cecil Chubb became chairman. Whilst he was in charge the hospital became the largest private mental hospital in Europe. He was also a JP, successful racehorse owner and breeder of Shorthorn cattle. Stonehenge. The Antrobus family bought the Amesbury Estate, including Stonehenge, in 1824. Edmund Antrobus, heir to the estate, was killed in the 1st World War, and his father, Sir Cosmo Antrobus, sold the estate in 1915. Included was “Lot 15. Stonehenge with about 30 acres, 2 rods, 37 perches of adjoining downland”. Mr Cecil Chubb went to the sale without any intention of buying, “but while I was in the room I thought a Salisbury man ought to buy it and that is how it was done.” for £6600. It has been suggested that he bought the stones as a present for his wife, only for her to be less than pleased! He kept it for three years and then, on October 26th 1918 he gave it to the nation. To mark his generosity he was made a baronet in 1919. In that same year Mary Chubb sold the Berwick Estate to the Board of Agriculture, and transferred the advowson of the Church of St James to St George’s Chapel Windsor. Sir Cecil Chubb died in 1934. 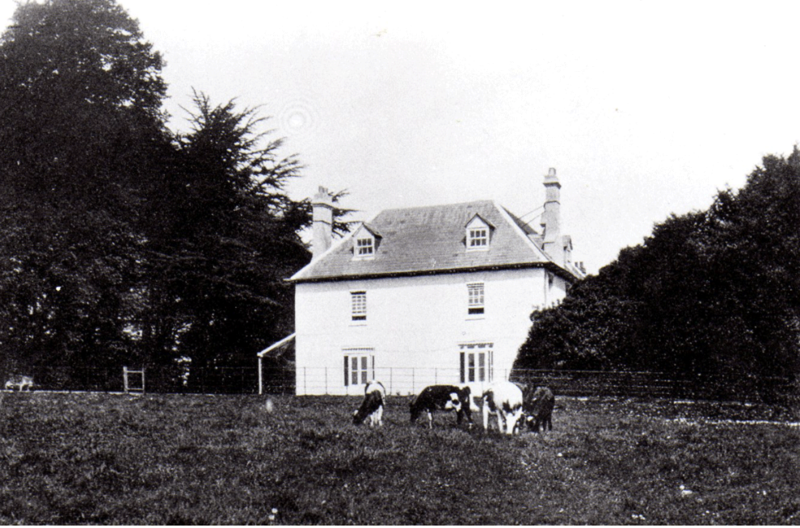 The Board of Agriculture sold the Berwick Estate in 1921.